Showing off his sharp teeth, with ears leaning backwards and mean looking golden eyes, this Timber Wolf in Parc Omega in Montebello, Outaouais in Quebec is one visitors should stay clear of. Whether the photographers or something in the region of the park have annoyed this Timber Wolf, capturing a picture like this is one which is far and few between. The sharp fang like teeth on the Timber Wolf are what it uses to hang onto its prey while using the smaller teeth to rip away the flesh. The teeth on the Timber Wolf is what most other animals fear along with them being the largest wild member of the Canidae family. Growing to be between 28-38 inches at the shoulder with the average weight being anywhere between 55 and 85 pounds. 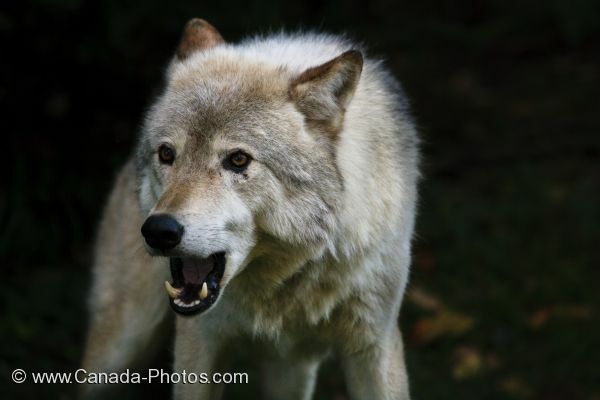 Picture of a mean looking Timber Wolf at Parc Omega in Montebello, Outaouais in Quebec. While traveling through Parc Omega in Outaouais, Quebec, many tourists stop for a long period of time and watch the Timber Wolves sleek about their habitat. Living in a highly hierarchical pack, the Timber Wolf is a beautiful animal even when it shows off its mean looking side. Timber Wolf, Canis Lupus, (aka Gray Wolf) at Parc Omega in Montebello, Outaouais, Quebec, Canada.